What are your plans for the upcoming Easter holiday? Are your lesson and activity ideas purely fun or do they have an educational twist to them? Let’s face the reality, it is difficult to continually keep your students engaged. So, why not take advantage of the holiday and sneak in a hygiene lesson with the holiday proceedings? The students will be able to understand that doing one thing better each day dealing with hygiene can make a big difference in the level of health they experience. The students will learn hygiene and infection control principles through an Easter themed lesson, activity and game. 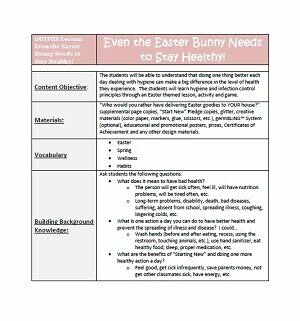 Also contained within the lesson includes a list of proposed materials, vocabulary, background knowledge, exploration activity, explanation, hands on experience, wrap up and home connection. The cold and flu season is still in play so teaching about germs, hand washing, cleaning and other health principles will be beneficial at this time. Already done a hand washing lesson? Mix it up and have a competition, play a touch game to see how far the simulation germs travel, etc. Students will love to see the simulation germs with the Glo Germ System (fluorescent germs with UV black light). There are so many health teaching opportunities with the fluorescent powder or gel that you can use it multiple times a year.